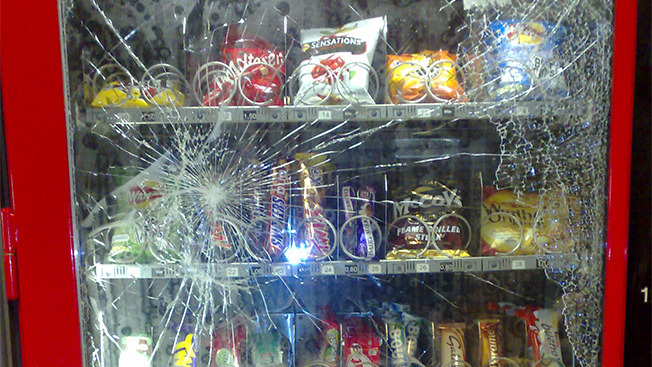 Why Are So Many People Attacking Vending Machines These Days? Crime sprees of any kind can be hard to explain, but a recent cluster of attacks is bound to leave even the savviest criminologists puzzled: More Americans seem to be attacking vending machines—specifically, the ones that sell snack brands. On Aug. 1, a man driving without pants in a white pickup truck attacked a Coca-Cola machine at a Goodyear Tire Center in New Orleans, the crime caught on a security camera. In late June, Benton, Mo., police arrested a 44-year-old male who was seen attacking a snack machine with a large knife. These incidents follow an especially colorful episode several months ago when a 27-year-old warehouse employee in Des Moines, Iowa, grew furious after his Twix bar got stuck in a vending machine, and then attacked it with a forklift. (After hoisting the machine off the ground and dropping it, the perpetrator successfully retrieved his Twix bar—and got fired.) Then there was the April story in The New York Times that warned how digital miscreants are finding ever more inventive ways to hack into computer systems—including vending machines. New Orleans man breaks into Coke machine and splits. OK, perhaps these events are likely just coincidences bound to occur in the world of 24/7 Web news. Then again, they may also point to deeper issues related to how Americans work, play and eat. According to the latest statistics from Automatic Merchandiser magazine, America now harbors close to 5 million vending machines, into which we pumped $19.69 billion in 2013—a 2 percent increase from the year prior. Increasingly, vending machines don't replace our lunch; they are lunch. All of we working drones in cubicle hell have a story about the colleague who shook the office machine until dislodging the snack of choice. The site Officegamespot.com even has a vending-machine attack game called Mike Shadow: I Paid for It (“Game Overview: Smash the vending machine using a variety of attack options.”) So, clearly, many of us fantasize about attacking vending machines. Still, what can account for the actual willingness to put the hurt on the big ugly things? It may be the “strain theory,” an admitedly ill-proven doctrine that suggests tough economic times lead to violent behavior. Far more likely, however, is the indisputable increase in snacking itself. Not only do Americans eat 29 percent more food today than we did in the 1970s, a just-released study by Nielsen demonstrated that a whopping 91 percent of us snack each day—men, in particular, while at the office. But before you head off to attack that vending machine, beware. According to the most recent data available from the Consumer Product Safety Commission, since 1978, 113 people have been injured and 37 killed when the vending machines they were assaulting fell on them.